My name is Pat Cohen. I live in upstate New York where there is an abundance of warm water streams, lakes, and farm ponds to fish; although most anything with gills is fair game. I was always a terrible fisherman with spin and casting gear, but I began fly fishing in 2008 and since then I have caught more fish than I can count. I have been tying flies since January of 2009. Fly fishing and tying have become an essential part of my life. I specialize in deer hair bass bugs, but I tie everything from streamers to nymphs. The artistic freedom that fly tying offers is what drew me to it. All of my flies are meant to be fished with the exception of the display offerings. Every piece of each bug - be it the hair, feathers, or weed guards - has a purpose. The final product is a fish catching fly and a miniature sculpture all in one. 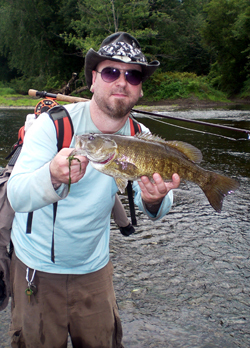 To my way of thinking, there is nothing like watching a five pound bucketmouth or an 18 inch smallie erupting from the water to crush one of my bugs as it's drawn across the surface. Although I spend a majority of my time pursuing Smallmouth and Largemouth bass, I am passionate about pike as well. When given the opportunity I will chase just about any species with a fly rod that I can. I have pursued trout, peacocks, steelhead, salmon, even salt water species such as stripers and snook. If it swims and eats other fish, my flies will catch them. I have a deeply ingrained passion for chasing golden bones; carp on the fly is a challenge that more and more fly anglers are only beginning to appreciate. Carp are by far one of the most difficult fresh water species to hook with a fly, and I've created a wide variety of nymph patterns to target these misunderstood and often maligned game fish. There will be continuous updates to this site as new offerings are added. If there is a fly that is missing that you would like to see, if you have any questions or are need of a specialty color or pattern, then please feel free to email me and I will do my best to accommodate your request. I tie all of my flies per order, so there are times when it will take me 2-3 weeks to put a large order in the mail. I take no short cuts and make each and every fly as durable and of as high a quality as I can. As a working artist, I try to add an artistic flair to all of my fly creations. I hope you enjoy them as much as I enjoy creating them. I am a member of the pro team for 3-Tand Reels, Epic Fly Rods, Peak Vises, Loon Outdoors, Custom Gheenoe Boats and Predator Fly Gear. I regularly demonstrate fly tying at various events and fly shops.